Rapid expansion of IoT devices forming an artificial intelligence of things (AIoT), the next generation in industrial automation. With artificial intelligence, IoT devices work as a network of learning and thinking objects. Winmate has developed products to tap into the AIoT industry applications in factory automation and machinery equipment. Our IoT Gateway EAC Mini helps to bring computing to the edge of the network and allows more important data to be processed and analyzed closer to the source. Expansion modules offer greater options for additional serial interfaces; from USB ports to Bluetooth 4.0, Wi-Fi and 4G. 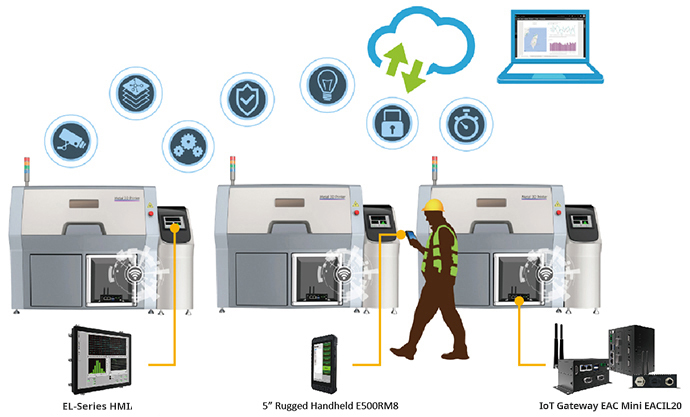 Wireless connectivity and all necessary connectors allow the EAC Mini to send data from manufacturing facilities directly to cloud server. HMIs provide interface for operator control and data visualization. Meanwhile, mobile rugged devices help to streamline workflow efficiencies and bring control to remote workers in and outside the factory flow. Winmate’s products help integrators to leap into the era of AIoT and bring all the benefits of connected devices to the market.